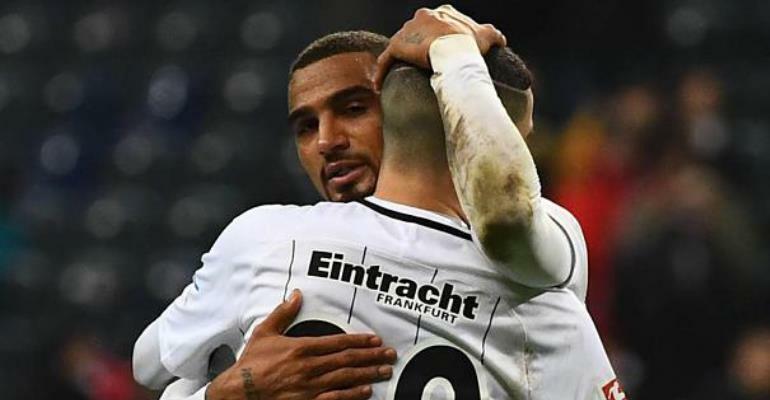 Eintracht Frankfurt winger Marius Wolf believes the absence of Kevin-Prince Boateng and Omar Mascarell contributed to their defeat against VfB Stuttgart over the weekend and hopes to have the duo back in their upcoming clash against Hannover 96 this weekend. The Eagles three-match winning streak came to an end over the weekend they suffered a 1-0 defeat against VfB Stuttgart at the Mercedes-Benz Arena courtesy Erik Thommy's 13th-minute strike. Niko Kovac's charges missed the services of Ghana forward Kevin-Prince Boateng and on-loan Real Madrid midfielder Omar Mascarell to suspension and injury respectively. Before the game, Boateng insisted his team-mates have enough fire-power up front to cope with his absence, "The boys can do it without me". But, many believe the Commerzbank-Arena outfit lost the match due to the absence of the duo, an assertion in which coach Kovac did not agree, "We failed collectively. I do not know if Kevin could have done that on his own," Niko Kovac said. And, in-form winger Marius Wolf also disagreed with his manager as he indicated that part of their defeat was down to the absence of deadly duo. "These are two super players. All, who played here, but can also kick and have our confidence. We simply did not do well as a team," Wolf said. Frankfurt sits 4th spot on the Bundesliga standings with 39 points after 24 matches.